The Sun represents masculine energy and illumination. Its eight rays represent the solar holidays around the Wheel of the Year and the eighth Sephiroth of the Qabalah, Hod, with its energy of knowledge, instruction, and truth. It also reflects the Sephiroth of the Sun, Tiphareth, and center of balance and transmutation. The Cresent Moons represent feminine energy and the ebb and flow, waxing and waning nature of all things. The energy resonates with the ninth Sephiroth, Yesod, and the energy of the Astral and dreams. The jagged mountain line represents Earth directly and the home of the Catacombs of Mystery. 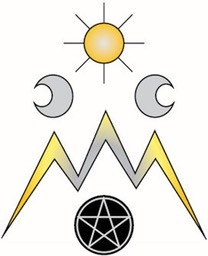 The three peaks are the Three Worlds and resonate with the third Sephiroth, Binah, the first place of Form. It is stylized to remind us of the Qabalistic Lightening Flash. And to remind us of the flash of inspiration and insight made material and enacted. The pentacle below is the Gate to the Shadow Realm and the Catacombs of Mystery. The place where many of us have often misplaced much of our personal power. The Pentacle glows within the dark mouth of the Gate to remind us that there is always light within the dark, if you are brave enough to search for it.